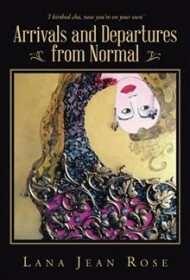 A girl raised in a dysfunctional family struggles to make it on her own in this plot-thin yet colorful and dark novel. Protagonist Airstream is a young girl in 1950s Texas. Week after week, she and her brothers witness their mother, Debbie Jane, creating bizarre art throughout their home using odd environmental items such as black widow spiders. Airstream is neglected by her mother and emotionally and physically abused by her dad. The day Airstream turns 18, she returns from school to find her personal items on the porch along with a $50 bill and a note saying, “Good luck.” Instantly homeless, she scrapes and claws her way through life, experiencing both great and dismal times while struggling to be an artist. Despite growing success as she ages, she longs for love from a man who seems unattainable. She also learns her offbeat behaviors stem from a multiple personalities disorder that is blocking her journey to happiness. Author Lana Jean Rose is at her best when penning comic scenes with disturbing undertones and offering lively details regarding Airstream’s parents’ character flaws. Rose has a flair for dialogue and is adept at capturing Airstream’s mother’s Texas drawl: ” ’bout time we did some re-deck-er-ate-in!” and “ack-shoe-ally. . . “. The book elicits empathy by allowing readers to slip inside the protagonist’s deepest thoughts. However, the novel’s big failing lies in its lack of important plot structure. There’s no clear narrative hook or main dramatic conflict to be resolved. Instead, the story reads like a memoir disguised as a novel, offering a series of chronological scenes without key motivational details that cohere to give the main characters stronger direction. This robs the novel of its power to propel readers forward as they anticipate the outcome. The book’s dearth of such plot elements utlimately inhibits its effectiveness. Nonetheless, it may appeal to readers who have similarly grappled with a difficult upbringing.